English Language Arts should be a time to build your students' passion for reading, writing, and learning about the world around them! Without interesting and engaging activities, students will become bored and off-task very quickly. How do we avoid such catastrophes in the classroom without spending hours creating fun games and engaging tasks from scratch?! If you're a part of the BCPS teaching community, you have plenty... emphasis on PLENTY of resources available to you! If you are not part of that community, there are TONS of free resources out there already created for you. I've done the searching, so here's the opportunity to share! First and foremost let's talk about the start of your Language Arts lessons. Phonics and grammar instruction are necessary in all elementary grades. Students benefit from a whole group lesson that is on grade level and then receiving customized instruction during small group learning and independent work. For more on my Word Work (Phonics) and Grammar lessons, look for a future post on this topic! Language Arts whole group instruction can include a lesson on a reading or writing strategy or skill. I fully believe in modeling what I expect to my students. When you model, they mimic and hopefully repeat when they are working independently. To ensure this happens, make sure you repeat every opportunity you have in front of your students! Good habits are definitely learned when practiced!! Compare and contrast a firsthand and secondhand account of the same event or topic; describe the differences in focus and the information provided. By creating a plan and taking it slow, my students will prove to be more successful mastering this standard by the end of the school year. Then comes my favorite component of ELA instruction--Workshop Rotations!! Taking aspects of The Daily 5, Guided Reading, and other resources I've stumbled across, this process works best for my kids this year. It changes each year! Always teach to the students you have. WORD WORK- using what we've done in whole group phonics and grammar, students complete different tasks that enhance or reteach the learning. We are fortunate enough to have Wonders from MacGraw Hill and their digital resources. Students play word work games and submit assignments on their "To Do" list. Keep and eye out for other activities in future posts! READ TO SELF- students need to read to self in order to progress in their reading fluency, comprehension, and confidence. Free books to read through Epic! Look out for Scholastic Warehouse sales that happen once a year! WORK ON WRITING- students need to have writing fluency as much as they need to have reading fluency! Build it up by having your students write each and every day. Make writing fun and engaging by providing options, a variety of writing tools and resources, and ways for students to publish their writing pieces! Introduce a variety of writing formats- poetry, stories, songs, lists, news articles, blogs, emails, letters, research reports, presentations, speeches, essays, informative videos, infographics, scripts, etc.! "Old fashioned" foldables are awesome! Enter them (with parent permission) in writing contests! 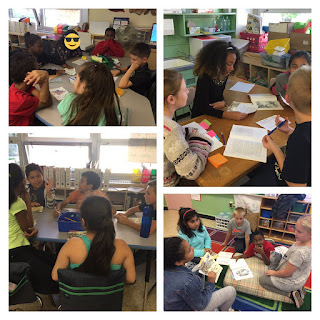 SMALL GROUP INSTRUCTION- a time to meet with flexible groups of students to teach guided reading, literature circles, word work, interventions, and enrichment activities. My running records/small group meeting sheet I keep for each student when they are whisper reading to me. MORE WORKSHOP ACTIVITIES- I don't always stick to the four rotations listed on the board from this particular day. Sometimes the rotation will change to something relevant to what we are working on during ELA, social studies, or science instruction. I mean... why not? They're readnig and writing in science and social studies to learn about the content! In addition, workshop rotations can include games I introduce during whole group learning. An activity that includes social studies or science activities relevant to what we are learning. Twitter feeds to use as an interactive board for morning meeting shares, discussion group posts, ideas about a book, writing topics, or a cool way to write shout outs to other students! The learner-centered environment is just the start of what makes this M.A.T.H. Rotations Model so awesome. Students work in a variety of customized learning situations. Small group and independent activities are personalized to their learning needs. Each LCE model has its place and time in the classroom. M.A.T.H. workshop cards are used in the classroom to guide students through their rotations. The complete OneDrive folder that includes all of my math resources. I follow the BCPS curriculum and incorporate other resources. Feel free to use them as you see fit with your students! Number Talks are essential to whole group math learning. Students work on a posted task on a whiteboard or their math journals. Some students may have difficulty with the task and are asked to write a question or something they notice about the problem/solution they were starting. A discussion emerges and I write what what the students say or ask. Number talks are a great way for students to share their thinking and work through demonstrating number sense together. The teacher should be the facilitator in these situations and ONLY the facilitator! Observational and anecdotal notes when walking around the room and a quick check are necessary prior to group rotations in each lesson. Quickly assessing the students allows me to responsively group them to prepare for small group instruction. Low and high tech options are out there! Making Sense is a time when students should collaborate with one another. Group discussions and supporting one's thinking are essential during math learning. Students learn when they are problem solving with one another or helping to guide a peer to success. Examples of Making Sense activities can be found in my resource folder. At a Seat is a time for independent work. 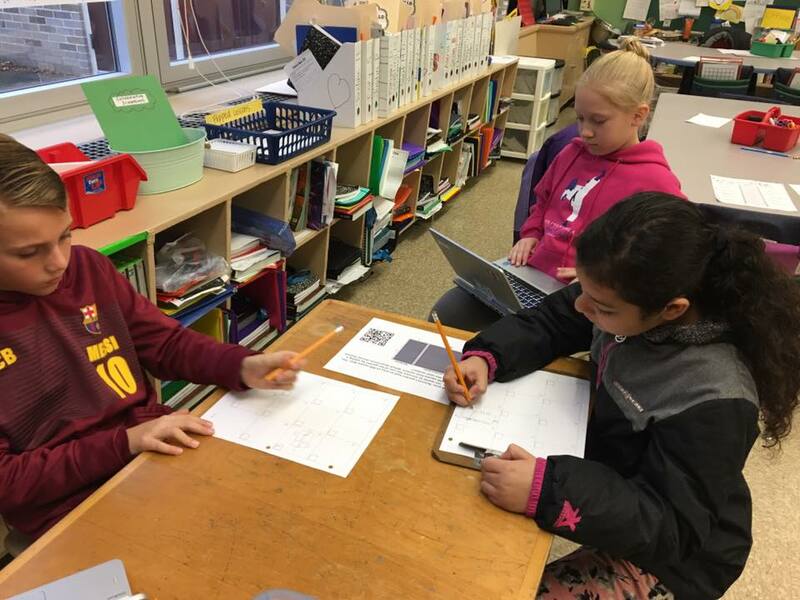 Students can engage in a math task, write in their math journals, watch a video that reteaches the skills or strategies from the lesson, or use an online math program that guides their learning. Writing during independent work is extremely important. Students should be able to take what they have learned and explain their thinking using words, numbers and/or symbols. Technology is a time when students can work on an online program that adjusts to their learning needs. Some free online resources I use in my classroom are listed below. BCPS has purchased Dreambox which works wonderfully in my classroom. However, there are times when I offer other options to keep things interesting. 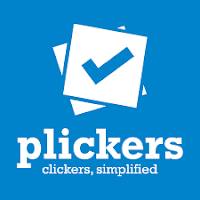 If your students have access to technology at home or you are like me and enjoy throwing in a flipped video every now and then, there are great sites and videos out there already created! After you find the right video, I strongly suggest you use a learning platform to host it. There are a few great ones below. I rely on OfficeMix because it's easy to use and does everything I want! Trying to think of fun and creative ways to review for a math test can be tough! With the help of my school's Library Media Specialist, I created an activity that gets the kids up and moving, working on their math strategies and skills, and engaged in an end goal! I taped the 20 posters around the room for the kids. Each student got a recording sheet where they were required to show their work and write in their letter clues. There are 20 posters with 20 different problems. Students moved around in small groups or independently in random order. They were to start at any poster and go to a free poster once they were ready to move on. 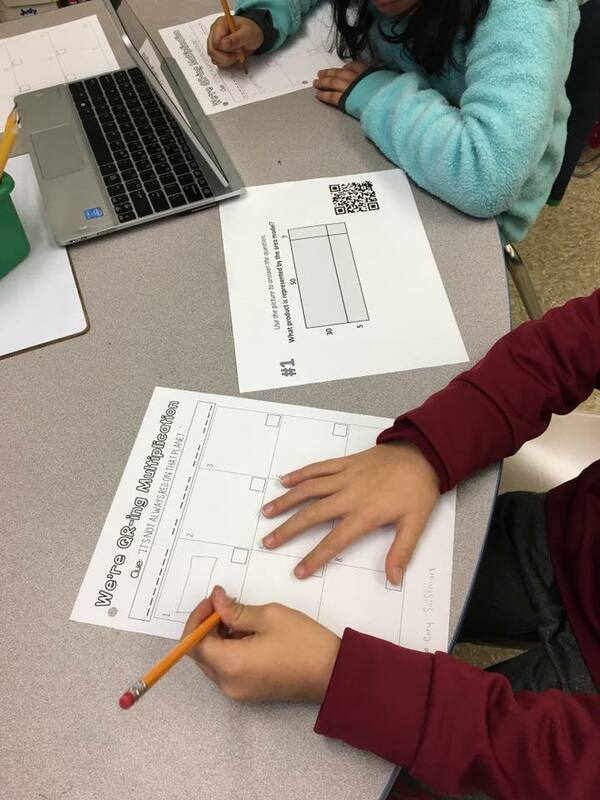 They problem solved together and checked their work with the QR code which provided them with the answer and a letter clue. They loved it! My kids couldn't get enough. They were fully engaged the entire time, encouraging each other positively, and checking their work to ensure their answer matched the QR answer. By providing them with the answer, they were able to guide their math problem solving if they were incorrect in the first place. 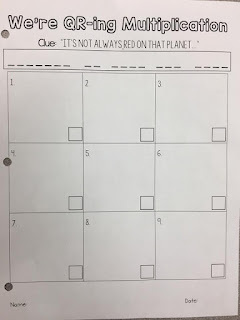 The secret message had to do with our previous science unit. Once the students unscrambled the message, they handed their review sheets in so I could look at their math work. They came to conference with me about what problems gave them trouble, questions they had about their math, and to get their recording sheets checked. If you're interested in using this method of reviewing multiplication in 4th grade, click below to download it for free! Our Donors Choose project was funded! We are so grateful and the chair pockets look amazing in the classroom. Kids are now able to store their devices and their Study Buddies in an accessible place so they can work more efficiently! On another note, our fourth graders have been working on their novel studies and we are almost finished! BCPS Unit 1 focuses on biographies and what makes an individual memorable or a positive influence on others? The two autobiographical novels we're reading are The Tarantula in My Purse and 172 Other Wild Pets by Jean Craighead George and Where the Flame Trees Bloom by Alma Flor Ada. 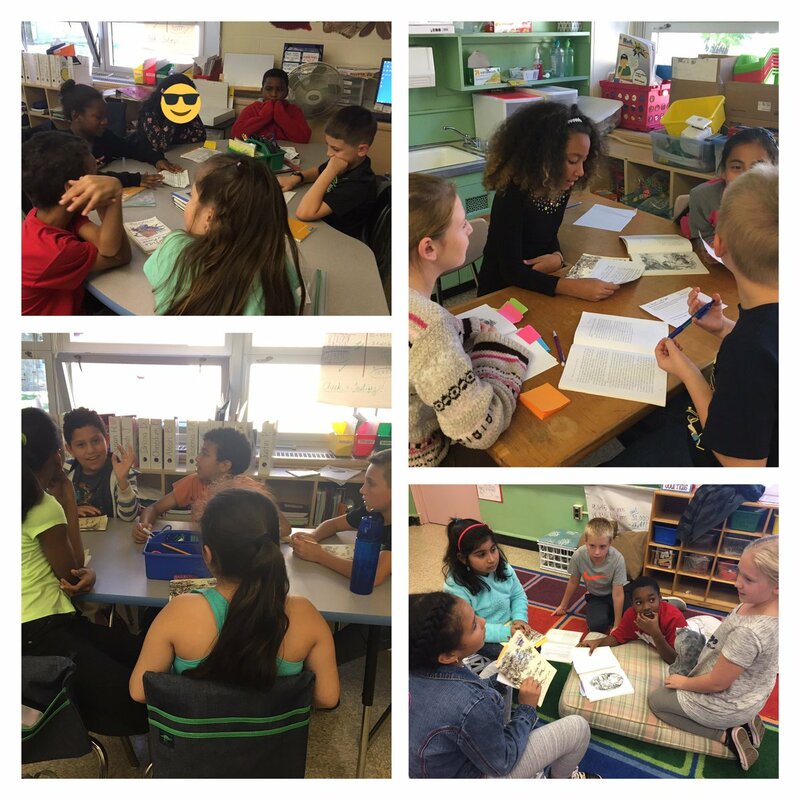 BCPS provided us with journal ideas which we have made into discussion prompts to prepare students for the following day's literature circle or small group meeting. Each discussion sheet also includes a section for a "thick question". If you haven't worked on thick questions yet, you need to! Your kids will be thankful you did. Thick questions are questions that get people inferring or drawing conclusions and are not simply pulled from the text. Here's a great resource from the Curriculum Corner to get you started. So, once you have thick questions down with your kids, you can get these discussion sheets going! 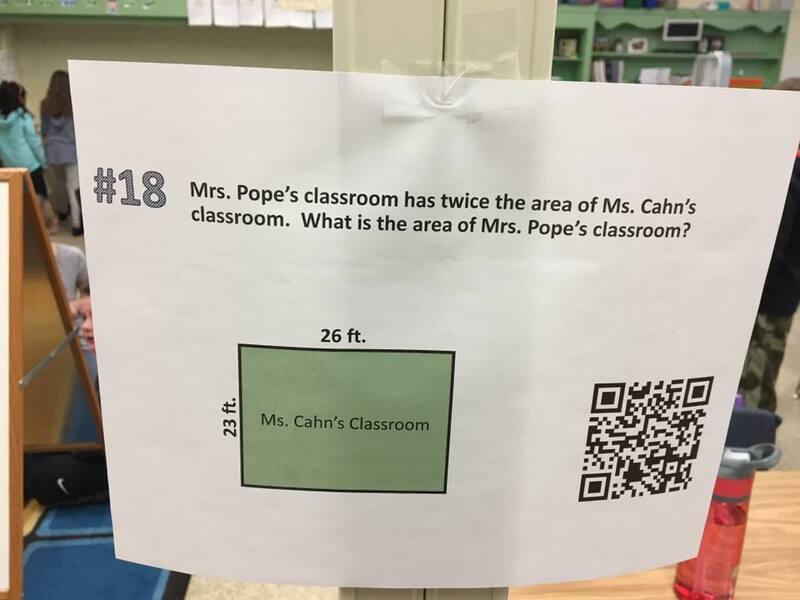 For those 4th grade BCPS teachers, these resources are really for you. Please feel free to use them with your literature circles during Unit 1 in ELA. All we did was take the journal questions/prompts the county gave us and put them on half-sheets for homework reading. 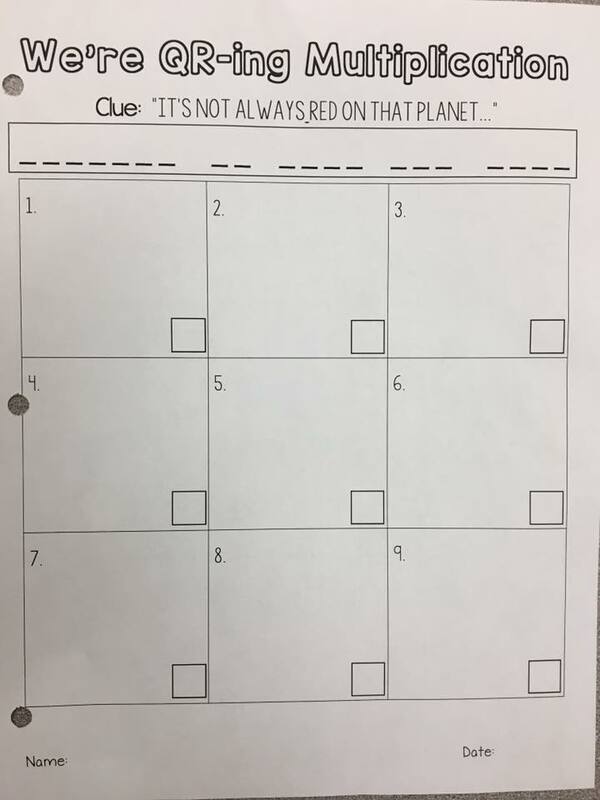 This homework holds kids accountable, gets them reading at home, and then allows them to bring something to their groups the following day. My students love to complete their discussion sheets and create their own thick questions for their fellow group members. Discussion sheets allow each student the think and processing time they need to be prepared to participate. When we are working in small group, I become one of the group members and participate in the discussion. When we model the behaviors we expect in the classroom, students follow suit! Here are the discussion sheets for the two novels. Credit in shared efforts go to my teammate, Jen. Hope you find them useful! Please consider donating to help our classroom! We are currently in a temporary building waiting for our new school to be built. Fortunately our new classroom has tables this year instead of desks! The one downfall to this is, I have no storage for my students' supplies and materials. Each day they keep what they need for learning in their backpacks. The backpacks are either hung up across the room or sitting beside their chair. When students get up to go to their backpacks every time they need something, they lose learning time and/or disrupt other students. If they choose to keep their backpacks next to their seat, it causes a huge tripping hazard and we have already had three falls! If you can help in any way, it would be greatly appreciated by us! The seat pockets are built to last years and years of different classes so they will be with our school for a long time. All of the information can be found on my Donors Choose site. 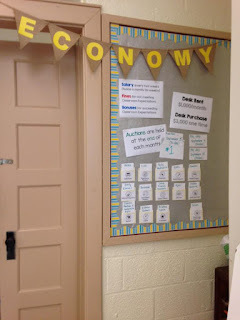 Another year with The Classroom Economy system! 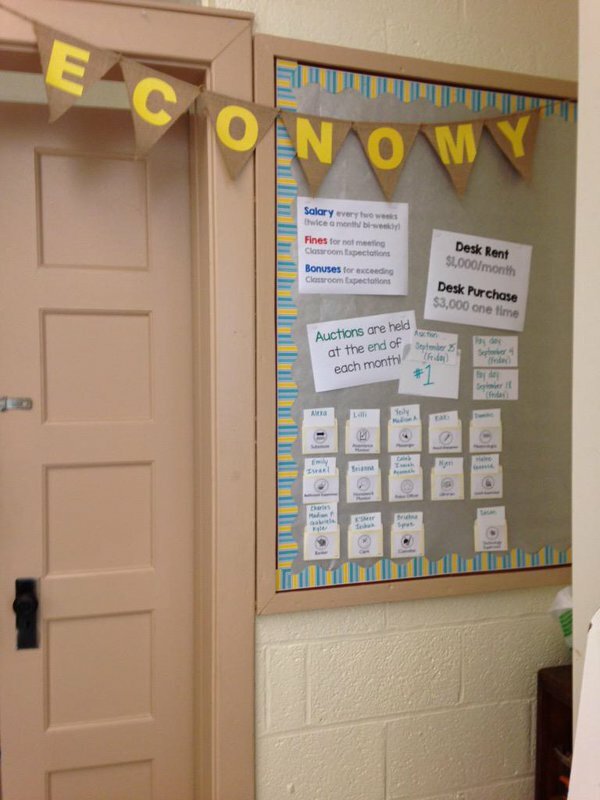 Last year was a huge hit and my students learned so much about economics and most importantly--they were practicing real life skills in the classroom. Students apply for jobs in the classroom. Some jobs require recommendations from adults who know them well. Students apply for a new job each marking period. Each job received a certain salary and paychecks are issued bi-weekly. Students keep their own wallets which include a space to store their money and a place to track their transactions (deposits and withdrawals). Students can earn bonuses for exceeding classroom expectations or fines for not. These are added or subtracted from their bank accounts with their assigned banker (another student job). At the end of each month, we hold an auction with classroom coupons and physical items to bid on. I usually ask for donations at the beginning of the school year from families and outside resources. Donation availability depends on what the store/restaurant has already given out for that fiscal year. Sometimes they're out of the goods, sometimes you hit the jackpot! This TpT store by "Stories by Storie" has a free set of Reward Coupons you can include in the auction! All of the resources for this program are FREE on the My Classroom Economy site. They send you the printed materials (some are printed in color! ), they have videos to show your class as you introduce the program, and lesson plans that guide you with implementation! The only things I have to make on my own are the wallets each year, the bulletin board, and the banker binders. If you're tight on funds, Pinterest has some great free classroom coupons for students to bid on during the auction. I make the student wallets out of legal manila folders (left over from our school office), a plastic baggie, and copies of the transaction sheets. These wallets stay in my students' Study Buddies (homework binders). Some kids like to hole punch them (two holes fit) or just leave them in their folder for safe keeping. "Catching them" exceeding expectations is the way to keep the economy engaging. Providing a warning before a fine will give the student a chance to right their wrongs. Bonuses can be given with exceptional behavior, dedication to a task, a kid who usually has the sillies all day focused and was an attentive group member, a compliment from another faculty member, excelling on an assignment. I try to stress that they should meet with their banker the afternoon or morning after they receive a bonus or a fine. This way, they can stay on top of their transactions. Students can only meet with bankers when they are unpacking for the day or packing to go home. Each Friday, I designate 20 minutes at the end of the day to tie up any loose ends they may have. Students do their jobs or they could get fired (this has only happened once!) and then will have to write a letter as to why they deserve to be re-hired, what efforts they will make to improve, and the importance of their position in the classroom. This year we are just beginning our Classroom Economy and will hold our first auction at the end of September. The students are so excited!